Canvas makes it easy to reply to messages from other users in your Conversations Inbox. 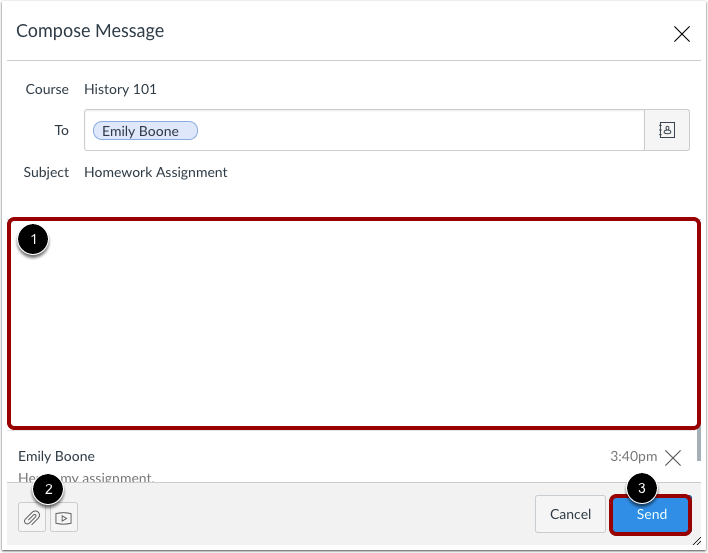 If you want to reply to a submission comment, you can reply using submission comments in your Inbox or directly from your assignment or quiz. Click the Conversation you want to respond to . Click the Reply icon in the message header, or hover over the timestamp and click the Reply icon within the message . You can also click the Reply icon in the toolbar . Note: If there is more than one recipient, you can reply-all to the conversation and everyone included will see your reply. Type your reply in the message field . You can attach a file or media . When you are ready, click the Send button . Your message appears in the preview text of the conversation  and at the top of the individual thread . Previous Topic:How do I attach a media comment to a message as an instructor? Next Topic:How do I privately respond to one individual in a group message as an instructor? Table of Contents > Conversations > How do I reply to a message in Conversations as an instructor?